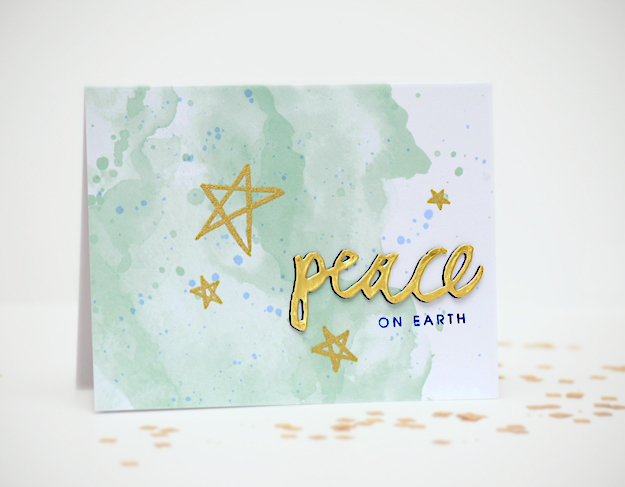 Sharing a card that combines a premade Happy Hues A2 card from Concord & 9th with an Ellen Hutson Brushstroke Christmas stamp set and Peace die designed by Julie Ebersole. Added some blue speckles from an old Stampin Up marker so it would tie in with the "on earth" sentiment. Love your card. I have those note cards too & this is a great way to use them. Have a happy day. those are such neat notecards and love how you used it - i THINK it's very pretty! Very nice! The golden accents are perfect for the gold word! Beautiful background and touches of gold Joan B! Joan, this card is simply stunning - and beautiful. I love the message and your design. I love using these card bases from Concord & 9th as well. It's a great way to start a beautiful card. What a fabulous idea to provide a card base with a watercolor background and you built on it beautifully!